Sony one of the first companies to take a stab at selling electronic books and creating competition for the Amazon Kindle, announced lower prices on new and best-selling e-books and unveiled two new models of its E-book Reader tablets. The price cut–from $11.99 to $9.99–brings Sony’s e-book pricing in line with those in Amazon’s Kindle Store. But, as in Amazon’s better-stocked storefront, some titles sell for less and others go for more: Dan Balz and Haynes Johnson’s “The Battle For America 2008” costs $16.47 at both the Sony and Amazon shops. Sony’s eBook Store also offers access to “over a million” public-domain e-books available for free through Google (Barnes & Noble’s e-book store, reviewed here a few weeks ago, only stocks 500,000 Google-provided public-domain titles). Sony’s new e-book readers will ship at the end of the month. The PRS-300 Reader Pocket Edition (shown above in “rose,” with navy-blue and silver versions available too) will offer a 5-in. screen and sell for $199–$100 less than Amazon’s popular, larger Kindle 2. The PRS-600 Reader Touch Edition, at $299, includes a 6-in., touch-sensitive screen. Each offers 512 megabytes of internal memory, far less than current Kindles, although the Touch Edition lets you expand that storage with its SD Card and Memory Stick expansion slots. 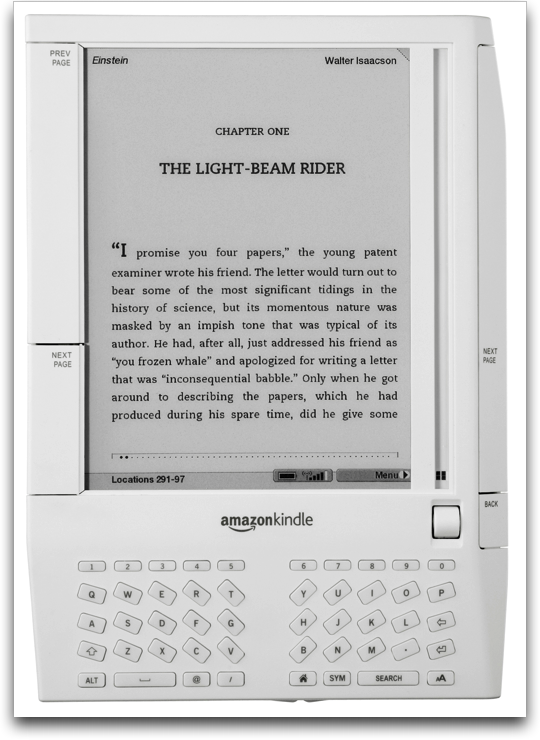 Both use the same basic type of grayscale “e-ink” screens as Kindles and so share such issues as a slow refresh rate compared to regular color displays. Sony will also ship a 3.0 version of its required Reader software that, unlike the current release, runs in Mac OS X as well as Windows XP and Vista. (OS X and Linux users can also employ a third-party, open-source program called Calibre.) 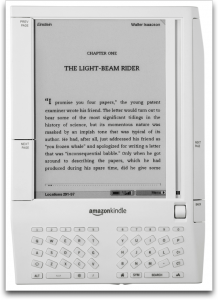 This software is required because Sony’s readers, unlike Kindles, have no Internet connection of their own; you must download your e-book purchases on a computer before copying them to a Reader. Brennan Mullin, vice president of Sony’s Audio and Digital Reading Divisions, said yesterday that the company is working on a reader with wireless access but didn’t provide any other details. After these updates, Sony’s e-book venture will share one other issue with Amazon and Barnes & Noble’s offerings: mandatory “digital rights management” usage controls. (For example, you can’t loan an e-book bought at Sony’s store unless the recipient has a Sony Reader linked to your own acccount, nor can you give an e-book a as a gift.) That, as I’ve written many times before, turns me off. Having lived through DRM restrictions on purchased music, then paid to get rid of it, I’m not interested in repeating the experience with other purchased digital media. How about you? Are you waiting for the right kind of hardware and software to start shopping for e-books, or do you first want to see a purchased electronic title come with the same ownership rights as a print copy?